Basil Duke was John Hunt Morgan's brother-in-law (he married Morgan's sister Tommy) and second-in-command. He had practiced law in St. Louis, but at the outbreak of hostilities, he was sworn in with Morgan as his first lieutenant. Duke was often the "clear head" that Morgan turned to, and he also served as a valuable chronicler of Morgan's war-time activities. Duke's book, The History of Morgan's Cavalry was published soon after the war, providing an almost day-by-day account of Morgan's battles, capture and imprisonment, and ultimate death. In an attempt to fend off those who would dishonor Morgan's name and reputation, Duke also served as a major Morgan apologist during the hailstorm of accusations and condemnations which followed soon after Morgan was killed. Always the literary type, Duke composed a poem, Morgan's War-Song, which sought to explain the passion Morgan and his men felt about their cause of Southern independence. 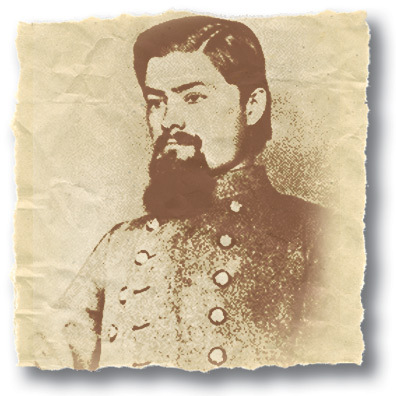 When Morgan liberated the town of Hartsville, Tennessee from Federal occupation in August of 1862, he noted that the Federals had closed down The Plaindealer, Hartsville's sole newspaper. Morgan then suggested that Captain Gordon Niles, one of his officers who had served as an editor befor the war, establish their own newspaper. The subsequent paper, The Vidette proudly featured Morgan's War-Song on the front page of their premiere edition. Hartsville's newspaper is still called The Vidette. The newspaper's tagline is "Founded by General John Hunt Morgan, August 16, 1862." Duke was promoted to general, and took over as commander of Morgan's ragtag raiders after Morgan was killed, seeing them through to the end of the war. He eventually commanded the soldiers escorting the last gold of the Confederacy and President Jefferson Davis in his attempt to escape in the Spring of 1865 (Davis was captured soon after he left Duke's protective custody). The gold of the Confederacy was split between the remaining soldiers. Duke lived to a ripe old age, later writing another book, Reminiscences of General Basil W. Duke and serving as chief counsel and lobbyist for the Louisville & Nashville Railroad, an institution he and Morgan had tried desperately to destroy during the war. © 2016 Electric Quilt Music. All rights reserved.